It’s not just laptops that high school students in Beverly and Burlington are issued. It’s a whole new route to education. Casey Hogan had never been inside a school in August, but earlier this month she arrived at Beverly High School to pick up a computer she’s been waiting to use for years. After identifying herself as an incoming sophomore, she was handed an Apple MacBook, and was online within minutes. “I can use it and won’t have to share it with anybody else,’’ said Hogan, 15, a member of one of the first four classes at Beverly High School that will be required to use a laptop. Along with Burlington High School, Beverly is one of the first high schools in northeastern Massachusetts to require a mobile learning device during school hours. In Beverly, parents lease the laptops for their children for $28 a month, and can purchase them when their children graduate if they have paid a total sum of $1,344. To date, more than 1,000 students have leased the laptops that they’ll take home each night. About 200 will use computers loaned by the school and another 50 will bring their own laptops to school. Judy Miller, the Beverly schools’ technology director, said the laptops are available through a lease agreement with Apple. In Burlington, all 1,100 high school students have received iPad 2s to use during the school year. There is no charge, but parents are responsible for the tablet computers that retail for $499, and many have taken out optional insurance on the devices. High School principal Patrick Larkin said the school has been planning to implement the new-style learning program for more than a year, a program that has been popular in Iowa and Maine but has been slow to catch on in this state. “Our job is to move forward and not create environments that are inhibiting,’’ said Larkin, who is also hoping to phase out textbooks in the next three years and replace them with an online curriculum created by students, teachers, and other educators. Larkin said the school district built $200,000 into its annual budget to cover the cost of the iPads. The two schools have their own policies regarding students’ Internet use. Both have filter and monitoring systems that prevent students from accessing sexually explicit websites. While Beverly plans to block students from accessing Facebook and YouTube, Burlington will allow students access to those sites. Officials from both school departments agree that the main purpose of implementing the program is to give educators and students more resources to engage classroom learning. Both will follow curriculums and guidelines that meet state educational standards. Talk to principals like Gallagher and Larkin and the word they use most often is collaboration. 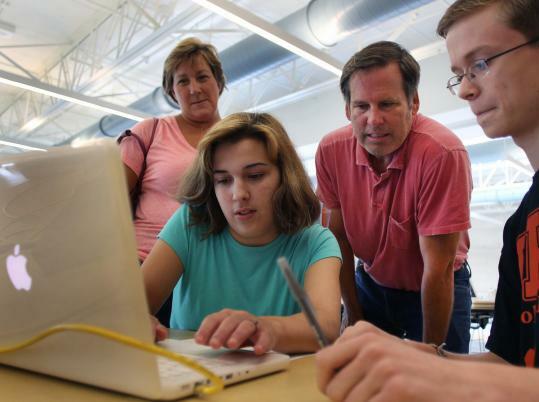 In Burlington, Larkin envisions each classroom as a learning incubator where teens brainstorm in small groups, work on research projects with other students using Skype or Google docs, use their laptops to create instructional videos, and ultimately discover the best learning style that works for them. There will still be some old-fashioned lectures, and some tests will be given on paper, but Larkin said the online technology will serve as a platform for students to access learning, a process, he said, that mirrors the real world. He also thinks that in the coming years, learning will take on a collaborative environment created by the students, where teachers will serve more like guides, oversee the classroom, and be available to help create individualized learning programs. Kartike Mathur, 18, an incoming senior at Burlington High, said using an iPad will eliminate the need for carrying around pens, pencils, paper, books, calculators, and nearly everything else he usually lugs around each school day. “I really can’t think of a good-paying job that doesn’t require a computer,’’ said Mathur. It’s not just youths who see the cyber light. At Beverly High, parents like Dave Hogan, 15-year-old Casey’s father, also called the computer a necessity for students. “It’s a way of life,’’ he said. As the Hogans picked up Casey’s computer, Miller, the school’s technology director, sat at a nearby table. The school, she said, wouldn’t be solely online: It would use a combination of online and paper tests. As in Burlington, teachers and students will have access to numerous educational websites dedicated to high school laptop programs. While students will have the ability to send instant messages and e-mails to other students, teachers like Beverly’s Gary Prodanas say they’ll change their class monitoring in order to prevent cheating. “In the past, I might be in the front of the room, now I’ll wander around and be in the back of the room,’’ said Prodanas, a science teacher. Prodanas plans to use online sources to supplement the traditional textbook, and said students will be better prepared when they arrive in class. He also plans to post each lesson plan online, and will implement a blog that will allow students to explain what they’ve learned. He hopes it will become a forum where students provide written feedback to their peers about group and individual projects.